Q. How will my order arrive? A. MyFlowerDepot currently hand- delivers your Philippine flower or gift orders for Metro Manila, ensuring utmost personal service. 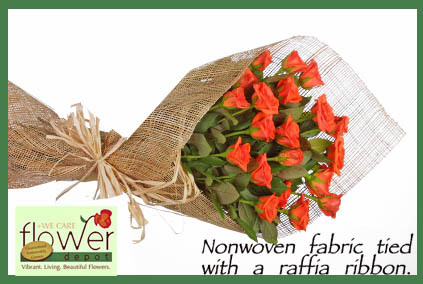 Our flowers are packed with their own floral tube, wrapped in non-woven fabric and tied with a raffia ribbon. Philippine Gifts are shipped with the flower order or in a separate box. Vases are shipped separately from the flowers, for the recipient to arrange in her own special way. Funeral or sympathy wreaths to the Philippines are encased in floral foam and personally delivered with its own stand.Your personal message and care tips are enclosed with your order. All orders are delivered with great care in our distinctive boxes. A. We deliver flowers and gifts to almost all areas in the Philippines. You may check our Delivery Areas for your guidance. You may also call us at 632-5539784 or email us at flowers@myflowerdepot.com to ask if we deliver to your recipient's area. Q. What days of the week do you deliver? A. We deliver flowers or gifts every day for Metro Manila destinations except Sundays and major Philippine holidays. For Provincial destinations, we deliver everyday expect Sundays, Mondays and major Philippine holidays. Q. When should I make my order? A. To ensure NEXT DAY delivery, orders must be placed the day before the requested delivery date by 4:00PM Philippine Time (+8GMT.) In case of SAME DAY deliveries (only for Metro Manila destinations), orders must be placed by 12:00PM of te delivery date. Q. What areas are considered Metro Manila destinations? What are considered Provincial destinations? All other cities or municipalities are considered as Provincial destinations. Q. What time will the Philippine flowers or gifts arrive? A. MyFlowerDepot delivers flowers and gifts from 11 am onwards. Please note that we cannot deliver after office hours or after 6:00 PM. A. We do not charge for deliveries. Philippines Flower Delivery is FREE to all destinations nationwide! Q. What happens if I supply a wrong address? A. Shipping address changes after order has been shipped will result in a $10.00 charge. Please be very careful when providing delivery details. Q. What happens if recipient is not present at time of delivery? A: To honor our satisfaction guarantee, the recipient may be called to schedule delivery. For residential deliveries, if the recipient is not available at the time of delivery, the delivery person may leave the package with a person claiming affinity to the recipient. Alternatively, the delivery person may leave the package in a safe place for the recipient to retrieve when they return or attempt delivery the next day. For business deliveries, if the recipient is not available to accept delivery, the delivery person may leave the package with the receptionist, security guard or lobby attendant. If the business is closed or not accepting deliveries, delivery will be attempted the next business day. Please note that in cases of repeat deliveries, we will be charging a $10 surchage. Q. What if I need to make changes to my order? A. Simply email us at flowers@myflowerdepot.com or through our Facebook page (Flower Depot Inc.), CALL us at 632-8140854 or 0917-6731947, a day before the intended delivery date before 4PM Philippine time about the changes in your order and we will gladly make the changes. A. Due to various seasonal and regional conditions, and the variety of unplanned issues courtesy of Mother Nature, availability of some flowers for Philippine flower delivery may be very limited in certain areas. Also, specific flower varieties or colors may not be available for to send to the Philippines on a specified day. Therefore, it is possible that the exact bouquet pictured or requested may not be available for Philippine delivery. Additionally, due to volume constraints, some Philippine gifts products may not be available at the time of order. Therefore, it is possible that the exact product/s pictured may not be available. In the case of non- flower products, we will deliver a of similar product of equal value and quality. Q. How do we get confirmation about our Philippine flower or gift orders or how do I check the status of my orders? Awaiting Fulfillment: We have your order and a member of our Team will be processing it for delivery. Partially Shipped: Your package is on its way! Completed: Your package has been received and has hopefully delivered your greetings and warmed hearts. Q. What credit cards do you accept? Can I use my debit card? A. For orders placed online or over the phone, we accept all major credit cards (American Express, Visa, MasterCard, Diners and Discover). You may also use Paypal. Simply shop and checkout and our site will direct you to our Payment Processor that will allow you to choose among credit card options or Paypal. We also have offline payment options such as Western Union and Bank Deposit. Q. How does the website bill my credit card? A. Once your credit card is verified and approved, your credit card company shall bill you at the local currency (unless otherwise specified by your credit card company), under the item Flowers. Q. Can I pay for my order offline? What if I don't have a credit or debit card, or if I have a problem using my cards online? A. We accept offline payments through Bank Deposit. You may check the details by logging in to our Offline Payment portion. Q. Can I make more than one order, to different shipping addresses? A. Of course. However, you have to order anew at the site by either clicking on the CONTINUE SHOPPING button while you are in the Shopping Cart portion or by again entering the site and buying again. Please write in the Special Instructions who the orders are for and specify in the Message portion your message for each one.& nbsp; Note that in case you order anew, you have to log in with your Username and Password in the Sign In portion of the site. If you are already a registered member, your contact details will be immediately reflected while you order so you do not have to retype it. Q. Where do your products come from or what does Fresh from the Grower mean? A. Flower Depot Inc., the owner and operator of www.myflowerdepot.com is the Philippines' premiere rose, gerberra, hydrangeas, carnations, snapdragons, limoniums and chrysanthemums grower. All the Philippines flowers that you see in our website our grown in our own farm and packaged in our flower arrangement facilities. Q. What can you guarantee? A. Every Flower Depot gift or flower is an expression of how much you care. If your order arrives in a condition that doesn't truly reflect those feelings, just call us at 632-8140854 and we will make things right. Q. Is the site secure and are my credit card details and information secure. A. Yes. As you note, we are being serviced by a reputable payment processor, and have displayed the 2checkout logo in our site. Q. How will I contact you for any questions? A. You can contact us anytime by emailing us at flowers@myflowerdepot.com or calling us at 632-8140854 or SMS 0917-6731947. You can also send us a message through our Facebook page (Flower Depot Inc.) by chatting with us through the website. You may also tweet us on Twitter (FarmstoHomes).